Charlie Hunnam is playing the young king-to-be Arthur, one of British folklore’s most noble characters, as a version of his dad – a real-life gangster. It’s an odd choice. But this is director Guy “Smoking Barrels” Ritchie’s version of the Arthurian legend. As Ritchie proved with his Sherlock Holmes, he’s never going to go for a straight take on an old classic. He’s going to take liberties. He’s going to allow himself several wallets’ full of poetic licences. He’s going to have some fun. And the big-budget King Arthur: Legend of the Sword is no exception. Ritchie has ripped Arthur out of the English countryside and into “Londinium”, a 7th-century urban landscape of post-Roman ruins, where Uther’s son is adopted by prostitutes from a brothel on London Bridge. As a young man, he is unaware of being destined for bigger things. “He’s sort of a regular chap, you know,” Hunnam says. “He doesn’t see himself as anything particularly special, other than his uncompromising will to survive. If anything, he’s ignoble when we first met him – he’s running a whorehouse and some protection rackets. It’s a character with familiar echoes for Hunnam. He’s coming from seven years on Sons of Anarchy, the successful and critically acclaimed TV drama about a gang member growing a conscience. But more than that: “I feel like my whole life I’ve been playing versions of my dad,” he confides. I visit the King Arthur set on a hard day at the office for Hunnam. The May sun is baking the huge Warner Bros studio backlot on London’s north-west fringe. The place is frantic with activity. The make-up and costume tents have processed 400 extras since six in the morning. Workers bustle over sets being dressed for future days’ shoots: carefully painting Styrofoam rocks, lowering looming cliffs down from cranes, spraying fake algae onto walls, carefully placing the stone from which Excalibur will be drawn. Just down a muddy track lies Camelot itself, the castle of legend, tucked away behind a line of orange traffic cones and a tall green screen on to which computers will project a warlock’s war elephant the size of St Paul’s Cathedral. Periodically all work pauses, the beeping of the reversing trucks is stilled. A major scene is playing out: mobs of extras surreptitiously check their smartphones behind ranks of armoured horses and hunting dogs with spiky collars, while on a stage Jude Law’s villainous Vortigern taunts Hunnam’s Arthur before a planned execution. Needless to say, things go wrong. A silver ball on a stick swoops in to cause trouble, and the executioner and Vortigern’s guards fall awkwardly under vicious attack from invisible terrors while Arthur fights free. I’m pretty certain some computer visual effects will make sense of this later. In a break between takes, Hunnam confides he’s finding it tough going. Sons of Anarchy gave him at least one fight scene an episode for seven years. Hunnam is ready for the big time – he established a reputation for daring, committed acting in the TV drama Queer as Folk, and hit Hollywood with a lead role in Guillermo del Toro’s robot vs alien blockbuster Pacific Rim. But Ritchie says Hunnam won the part of Arthur through force of will, not his CV. 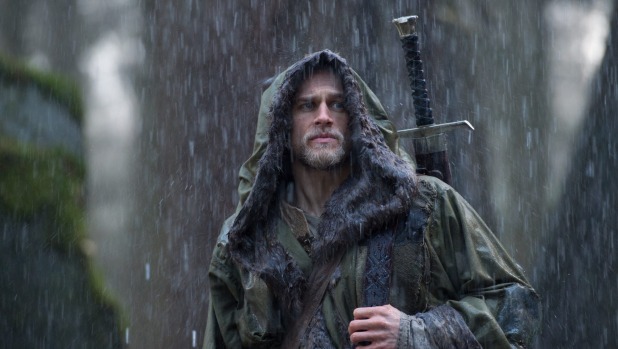 Hunnam says he literally threatened to fight his competitors for the role. Ritchie’s twist on Arthur doesn’t stop with the hero and the setting. The baddy of the piece, Vortigern, is a relatively obscure character in the usual legends. Jude Law, who plays him, says he was drawn to the character’s complexity, rare for a sword and sorcery script. Ritchie says he has “wanted to make King Arthur forever” and he doesn’t think anyone has really done it well. “I did enjoy the Boorman Excalibur, but clearly it was restricted by the technology around then,” he says. So he wrote a script. Then Warner came to him with someone else’s – which Ritchie loved for two reasons. First, it involved “very large animals” – such as 90-metre-tall elephants. Second, it covered Arthur’s rise to the throne, not his entire epic arc from boyhood to kingship, Holy Grail quests, betrayal and death. “It was magnificent, fantastic in scale and you didn’t have to address the entire narrative of King Arthur within two hours,” Ritchie says. There are rough plans for up to five sequels covering Lancelot, Merlin, Guinevere et al – depending, of course, on the first being a hit. King Arthur: Legend of the Sword is released in cinemas on May 18.